New to the range of QuakeHold! 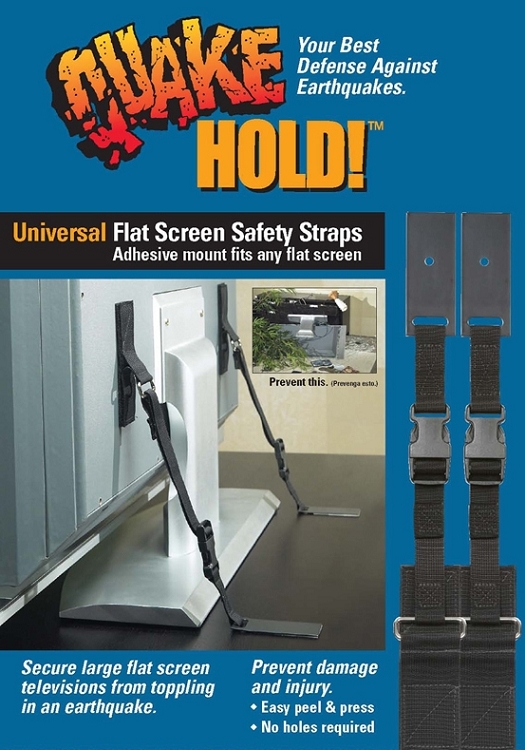 products is the Flat Screen Safety Strap. It has been developed to prevent modern LCD and Plasma flat screen TVs from toppling over, and features a ‘Contour Grip’ mount design with quick-disconnect buckles for moving and cleaning. Its superior strength, adjustable nylon straps mean no holes have to be drilled, and there’s no damage to furniture or equipment. The easy peel and press application makes installation a breeze. Straps are hidden from view. Secures large flat screen TVs up to 60” and 100 lbs. State-of-the-Art design fits all makes and models.